One-inch laminate top may be reversed during set-up between Mahogany and Medium Oak. Black steel base with full width 6-3/4"D steel shelf and privacy panel. Cable routing cutouts for installation along a wall. 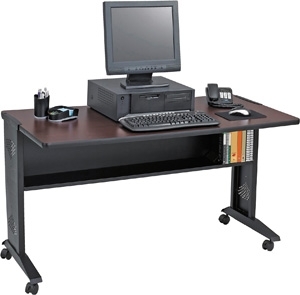 Create a customized work area by combining different size tables according to space and equipment requirements. Comes with four dual-wheel casters (2 lock). Assembly required.